A large gap in seasonal iron (Fe) data exists due to the lack of winter observations in the Southern Ocean (SO), largely due to the inaccessibility of this region during winter. It has been suggested that winter deep mixing is a major supply of dFe to phytoplankton in the surface waters and therefore winter Fe concentrations would serve has a baseline for primary productivity observed during the summer months to follow. In the SAZ (Subantarctic zone), modelling studies have also indicated that storm-driven mixing during winter and summer supplies Fe to the surface waters through entrainment of the Fe reservoir beneath the production layer. To better understand these factors and what ultimately drives Fe supply to the Fe-limited surface waters in the SO, observations over the full seasonal cycle are required. Field research was undertaken to fill the seasonal gaps in Fe observational data in the Atlantic sector of the SO then to understand the internal sources of Fe and how the supply of Fe drives the seasonal primary productivity witnessed in this region. 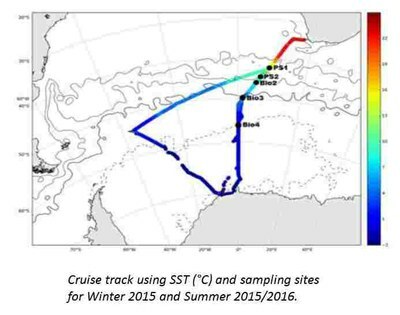 A total of 5 stations were made during winter, July 2015 and summer, Dec 2015 – Feb 2016. South of the Polar front an obvious consumption of Fe can be observed throughout the water column. In the SAZ and on the SAF (Subantarctic front), there seems to be a more complex consumption of Fe, specifically for the two process stations in the SAZ where an increase in Fe was observed from winter to early summer. This could possibly be due to the winter samples being collected during mid-winter instead of late winter, therefore not depicting the final winter reservoir. An obvious uptake of Fe is still observed in the surface water at the end of summer and this is assumed to be biologically-driven. The observing effort in the winter season should be continued to consolidate these results. Collaboration: N. van Horsten (PhD candidate), E. Bucciarelli (UBO), T. Mtshali (CSIR), A. Roychoudhury (U. Stellenbosch).